Avian Influenza was detected in seabirds in South Africa in December 2018, and sadly, the recent H5N8 virus killed over 500 African penguins on Halifax Island in Namibia. The virus has also impacted the bird population on the Namibian island of Ichaboe. 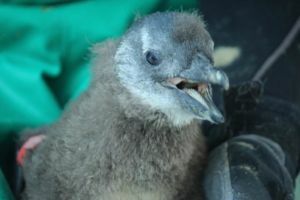 SANCCOB is assisting where it can by providing advice and supporting colleagues in Namibia, however, there is not much that can be done for the penguins that are affected by the virus. SANCCOB’s research programme will continue with the surveillance of diseases in seabirds in 2019, and has entered into a partnership with the University of Pretoria to undertake research into the H5N8 virus. Dr Katta Ludynia, says, “The 2018 outbreak caused relatively few African penguin deaths in South Africa but the virus killed a large number of Swift terns and other seabird species such as Cape gannets. Research and transponder work in the colonies were affected because access for researchers and staff was restricted to reduce the risk of transmission between birds and colonies. Low admission numbers at SANCCOB are partly due to the limited colony access of penguin monitors, besides the overall low breeding activities of African penguins in 2018 caused by low food availability. The lack of sardines, our penguins’ main prey, and the risk of possibly another Avian Influenza outbreak in South Africa puts additional pressures on the African penguin, which had its lowest number of breeding pairs in history in 2018.